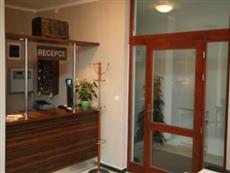 The Cyro Hotel Brno is situated in the center of the city. This is one of the closest hotels in Brno to the Spilberg Fortress. Other nearby attractions include cathedrals, museums, and the fair. The Cyro Hotel Brno is located along the city’s bus lines, offering easy access to attractions not within walking distance. Guests will also find that the bus offers easy access to the Brno airport. Taxis and rental cars are also available throughout Brno. The Cyro Hotel Brno offers a variety of guestrooms, all with three star accommodations. The rooms each offer television as well as minibars, complimentary newspapers, and more. All rooms also offer private bathrooms with showers. Guests of the Cyro Hotel Brno will find that shops and restaurants can be easily reached on foot. The hotel offers a café bar onsite. Other amenities of this pet and family friendly hotel include a massage area, a Jacuzzi, a spa, a garden, and a meeting area.